I don’t know about you, but all of the Cyber Monday/Week commercials/e-mails/banner ads last week made me feel like a chump for not taking advantage of the deals. Ack! YES! I DO want to save gobs of money and take advantage of free shipping! It is just barely December and I have major guilt about not having my Christmas shopping done. Amazon.com, stop pressuring me. Early December also means full swing party planning mode. I have a few get-togethers scheduled this month and I have a running list of possible appetizers to make. These Basil Slice and Bake Crackers are perfect for holiday parties. They can be made way in advance and frozen until party day. Slice and bake what you need right before the party. They smell crazy good while they are baking. These savory homemade crackers are packed with good stuff like parmesan cheese, pesto, fresh basil, and nuts. After making the dough you divide it in half and roll each half in plastic wrap and freeze until you are ready to bake the crackers. 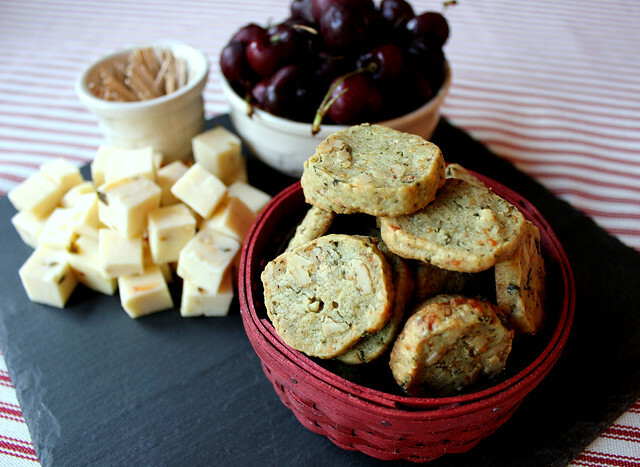 Basil Slice and Bake Crackers are the perfect pairing for a glass of wine! A couple of years ago I heard about www.WTSO.com, a discount wine website. They only sell one wine at a time at a discount of 30% - 70%. They always offer free shipping when you buy the minimum amount, which is usually about four bottles. My dad is a tough guy to shop for, but my brothers and I have had great success with WTSO gift certificates for his birthday and Father’s Day. He enjoys looking at the different deals and has ordered some amazing wines. I happen to know a few of the orders went through on his smart phone while out on the combine. WTSO.com gift certificates could be the perfect gift or stocking stuffer for your loved ones this holiday season. Fortunately, there is no need to worry about cyber Monday deals, they are always discounted! Whisk together flour, peppers and salt. Stir in cheese. Cream the butter and cream cheese in a mixer, add pesto and mix until combined. Add flour mixture in batches and mix until incorporated. Stir in nuts and chopped basil. Transfer half of the dough to a large piece of plastic wrap. Wrap the plastic around the dough and roll on a flat surface until it is a cylinder, about 1 ½ inch diameter. Repeat with remaining dough. Place the plastic wrapped dough in a Ziploc bag and chill until ready to bake. You can freeze if not using right away. Slice ¼ inch crackers and place on an ungreased cookie sheet. Bake for 18 to 20 minutes, or until slightly gold around the edges. Cool on a rack. Makes about 6 dozen.